A contact sensor is an important component of security systems and smart homes. Although it was originally designed to detect when intruders open windows or doors, the device has evolved over the years to offer more functions. It provides the data smart homes need to take intelligent actions. A contact sensor can turn your lights on, trigger smart door alerts on your smartphone or control a smart thermostat — the only limit is the imagination of whoever is designing the algorithm. How do contact sensors work? Practically, contact sensors tell a security system if doors are closed or open. They can be installed all over a house on the windows, doors or even desk drawers. 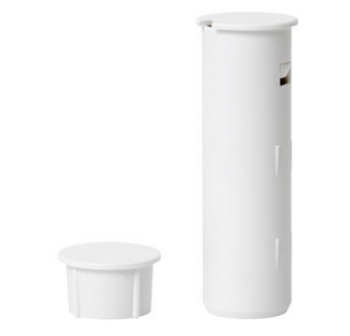 Available in two pieces, one part of the contact sensor is installed on the door while the other piece is fixed on the door jamb or frame. During installation, the two parts of the contact sensors are placed next to each other. A current is run through the fixed, wired (or battery-powered) part, and induced through the mobile part via magnetism. While the door/window/drawer is closed, the current flows through the mobile part, but as soon as the door/window/drawer is opened, the two pieces are separated, and the magnetic field is interrupted. The sensors detect this and raise the warning to their dedicated alarm panel. You may have seen in the wild both wired and wireless contact sensors. Fundamentally, they accomplish the same purpose (explored in depth later) but tend to present different use cases. Wireless contact sensors are mainly used in homes and residential units. They are generally sleeker, cleaner, and more aesthetic. They come equipped with all the standard wireless and Bluetooth capabilities, but at the cost of running on batteries that have to be replaced, and they are a bit more breakable. 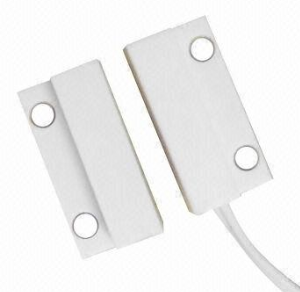 Offices, on the other hand, generally opt for wired contact sensors, much like the ones that Kisi offers. 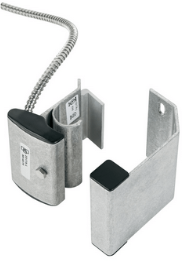 These wired contact sensors can be much more readily wired into existing access control or alarm infrastructure (alarm panels) and are generally more robust and resistant to wear and tear. In addition, you do not need to go around changing batteries often as they can draw power directly from the building. As such they present a more tractable alternative for busy office buildings, at the cost of perhaps some aesthetic niceties. Beyond wired vs. wireless, contact sensors come in many shapes and sizes. 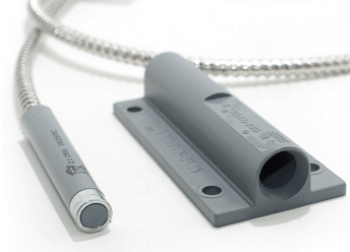 The following are some of the most common types of contact sensors you might find installed on a door or window near you. Overhead door contacts are used on large roll-up garage doors, and feature armored cables linked to the switch to make them more durable. Generally, garage doors don’t have ‘close tolerance’ when closed, meaning that there is usually a little gap between the door and the frame. This means that they require contact sensors with a wider gap, otherwise they will be prone to false alarms. 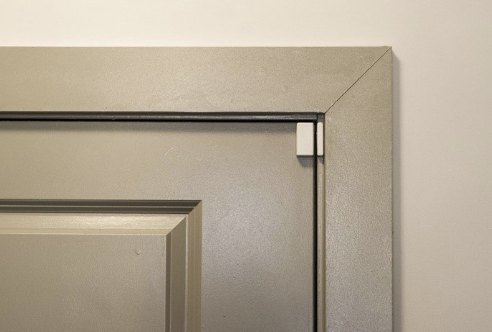 Installed on door jambs on the hinge side, roller ball door contacts are recessed inside the frame of the door. After installation, a roller ball will protrude further than the frame. The contact closes when doors are closed and opens when the converse is true, triggering the alarm. This is the classic door contact sensor. One (wired) part is installed on the frame, and the other on the door itself. The wired connections link the contact to the alarm control panel. However, this sort of tech is quickly becoming outdated with the increased popularity of wireless home security systems. Built with a hole and a magnet, the latter slides into the former to complete the circuit; if a door is opened, and the system is armed, the contact opens and triggers the alarm. 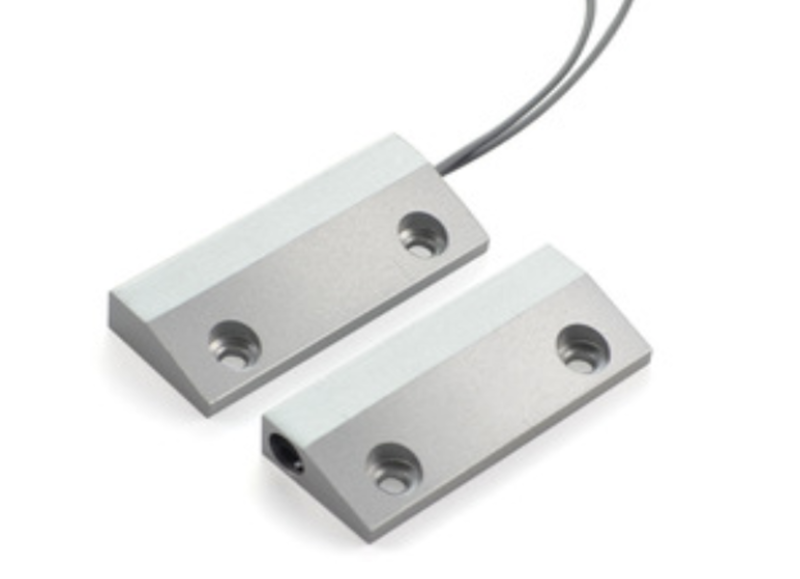 Pull apart contact sensors are often used on sliding gates. 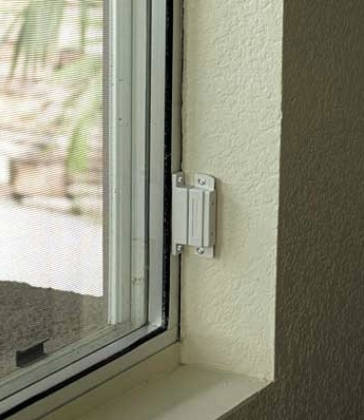 These contact sensors are installed inside windows or doors. Connections are soldered so the wire can move easily into the hole to make contact. 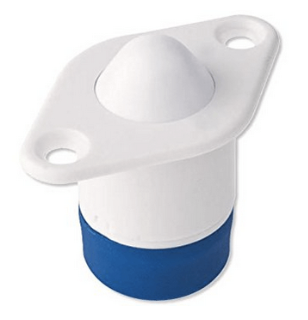 Recessed wireless contact sensors are used with wireless home security or alarm systems. Like most smart home or office automation gadgets, door contact sensors can (and should, in our opinion!) be integrated with your smart access control solution. Kisi’s solution offers just that: the chance to fully integrate your contact sensors with your door readers and controllers in one unified platform. 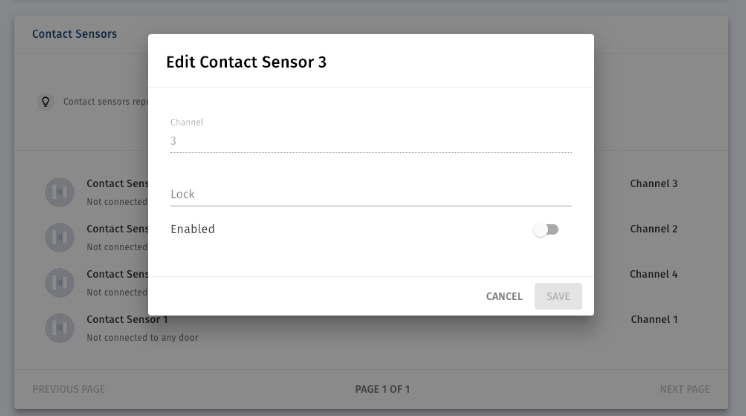 Here is a screenshot of the Kisi web interface for contact sensors. Every contact sensor is mapped to a Kisi door, and this is used as the basis for Kisi’s algorithmic tracking of door-forced-open and door-held-open alarms (more on these briefly). Thus you can expand your access control suite and make your home or office even more secure. With Kisi’s web or mobile platform, you can monitor all of your contact sensors’ status from the same interface from which you’re monitoring your doors. You can get real-time information and data, and most importantly, you can quickly act on that information by locking (or unlocking) doors and contacting Kisi representatives to determine the best course of action. 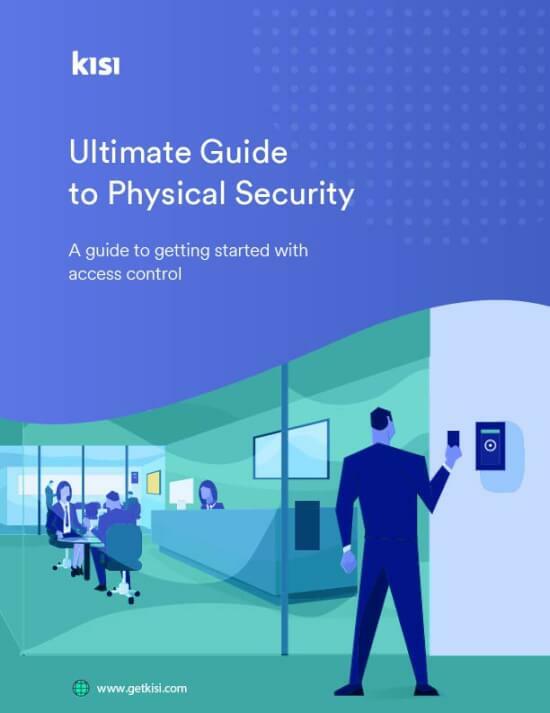 Besides access control integrations, there are many popular and useful applications for contact sensors, both in the home and the office. Kisi has outlined a few of the more salient ones that you might consider looking into. An important use for contact sensors is intruder detection and alarm triggering. These contact sensors can be installed on any point of ingress to your space, and behind the scenes, you can program them to trigger your home or office alarm to send you a notification (or even contact the police) whenever the door is opened at a strange hour. By ‘strange’ hour, I am referring of course to outside of normal work hours — you don’t want to receive a notification every 30 seconds when an employee enters or exits the office during the normal work day! Of course, algorithmic versatility allows for more subtle uses than that: you can, for instance, program them to only trigger an alarm if the door or window is held open for more than a certain amount of time — this is called a “held open alarm.” You might also want to know if it is opened more than, say, three times in the space of one minute. There are even ways of detecting if the door was violently forced open — these are called “forced open alarms.” It really depends on your use case, but as it is with algorithms, the possibilities are whatever you want them to be. A corollary of the alarm triggering is real-time monitoring of your doors or windows with smartphone alerts. Perhaps you’re worried about your space to the extent that you want to always know what activity is occurring, but not worried enough to notify the police every time the space is accessed. Thankfully, there is a middle ground, as modern systems allow you to program your sensors to send you push notifications whenever they are activated (or, as it was for the alarm triggers earlier, whenever the particular algorithm tells them to do so). Due to ease-of-installation, compact size, and easy wireless integration, homeowners or office administrators can use contact sensors to keep track of a slew of smaller objects, including (but obviously not limited to) jewelry boxes, server boxes, and safes. These will be receptacles that should never be opened except when the owner or admin does so, so it is clear that they will want to be notified of any unauthorized access. However, the applications can even be more mundane you might even want to put a contact sensor on your fridge to notify you if it has been left open for more than a couple of minutes, ensuring that your food doesn’t defrost or rot! On top of the traditional direct alarm and notification settings, contact sensors can often be integrated with the latest tech trends: smart home automation systems. I am referring here to those systems like Amazon Alexa, Apple HomeKit, or Google Home: hubs that control every smart appliance in your house, from light bulbs to cameras to toasters. By connecting your contact sensors to your smart hub, you can control things like lighting and temperature. For example, if a yard gate is swung open at night, contact sensors can be configured to turn on porch lights or thermostats, which can be triggered to automatically if they detect open windows or doors. This can help save energy for as long as the door remains open. 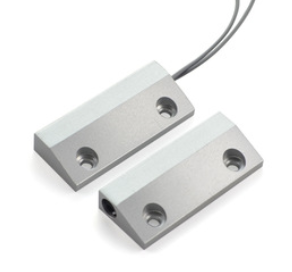 Door contact sensors can also be used as doorbells and offer protection for outdoor equipment such as ductless mini split air conditioners. With benefits ranging from increased home security to better protection of valuables, homes can benefit a great deal from door contact sensors. What’s important is having the right type of door contact installed on the type of door or windows it is meant for. It’s also important for the alarm system to be armed for contact sensors to work. Furthermore, the sensors can be installed on doors or windows or any other important part of the home in need of tracking.